Released in 1998, despite its name, Populous The Beginning was the third game in the "populous god simulation" series. 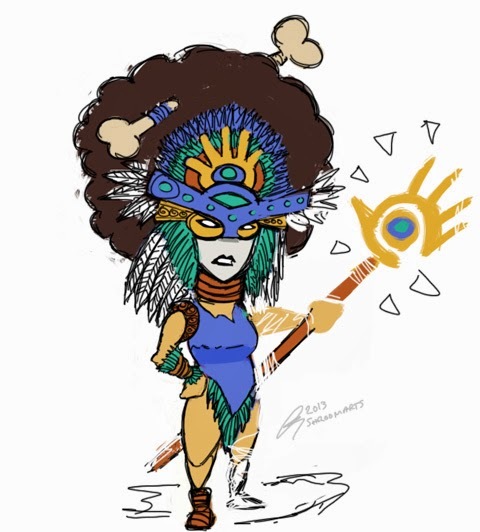 Players took the role of a Shaman, the mystical leader of a nameless tribe who had acquired mystical powers granted by ancient gods by putting on a mask filled with chicken feathers. She aimed to gain control of all the planets in the solar system believing she will be able to become a god or something. Whatever. My view towards Populous the beginning is mixed. Most people were into it due to the "god" like powers granted to the players but I was more interested in looking at its RTS side. Populous seemed like a simplified RTS game hidden behind "cause earthquakes, call down lightning" thing. I like the rugged, wooden huts, I like how they tried to keep the RTS mechanics simple with only few types of units, couple of buildings and tons of spells to cast so you don't actually stick to your base but mess around with your shaman instead, looking for stone totems to gain abilities and spells. (shame only a few per level) But at the end the gameplay felt somewhat empty because all you get to do was to build couple of huts, educate few savages and send hordes of priests to enemy huts to convert their savages while your shaman kept the other clan's shaman busy with devastating spells and that was it for almost every level, again and again. What I found interesting was the fact that each level takes place in a different planet in a strange solar system. Always felt as if it had something to do with aliens and was to connect its story with them in a way. Maybe its not the ancient gods that grant powers to the shaman but aliens who have abduct and probed her to make her take over the tribe and use her followers to do the aliens bidding. Each tribe can be led by different aliens and every tribe can begin the game looking the same and start to evolve towards their alien masters. Such setting would explain all the special powers, and mystical statues scattered around. It might even allow for some sort of "age up" system where you get to see your tribe grow stronger with high-tech alien powers acquired by worshiping the totems and alien head statures. 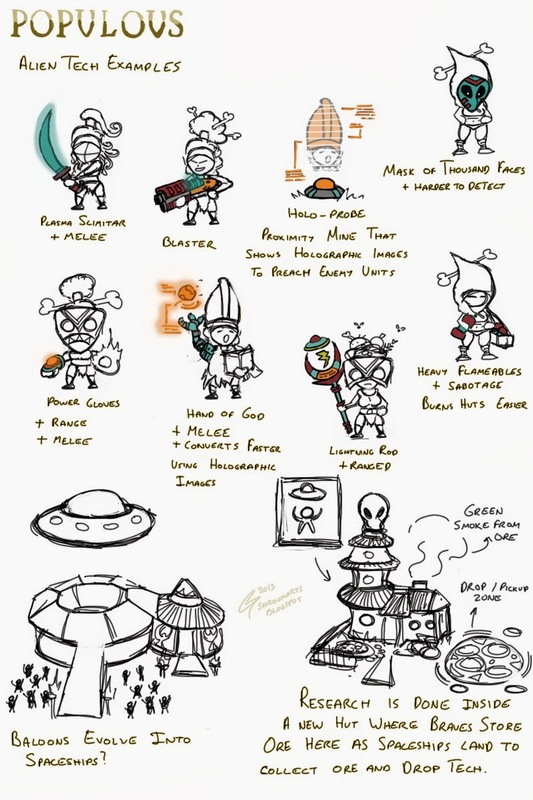 The idea got me excited at first so I jot down some unit concepts on villagers and units from different ages but after spending some time thinking about it the entire concept seams rather weak. Its more or less the same game with different skins and an upgrade system. It's a mod more than something new. Few modifications to gameplay wont make it any more appealing or any less boring than it already is. Also the concepts seem to lack progress as somehow I keep getting stuck at some points and cant seem to improve on the monotonous, cliché ideas that I come up with. I don't like the idea of braves (male workers or villagers if you will) going into huts and producing more "guys" its somehow feels wrong but explains why they are called braves :) Maybe the Shaman should be changed as a Male and all the villagers and followers should be female but that would make me a male chauvinist wont it. Also the "alien probed male" thing wont do any good either :) So i guess ill pick the "middle ground" and go for the shaman being female and her followers being female and they could go into the huts and do their lesbian thing and produce more ladies for the tribe. Suits me fine. Haven't thought of spells but would probably leave them as is. However there should be a slight difference here as spells should not be cast but "activated" using special alien technology in order to suit the new story better. For example lightning should be called via an alien artefact, or earthquake should be triggered using an alien seismic device that is placed on the ground, the flying monster in Angel of death spell should become a flying saucer etc. 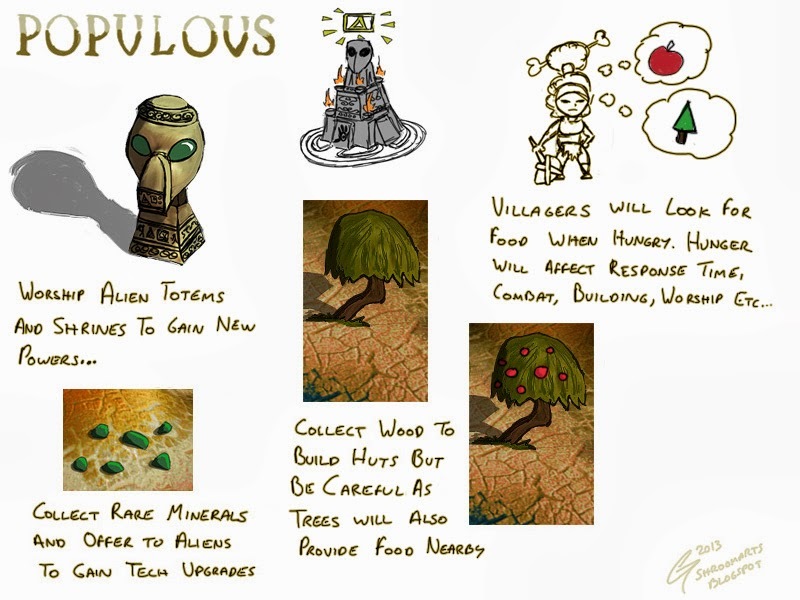 Populous 3 doesnt need any resources because all huts are made from wood and braves collect as necessary. As I plan to throw in bit of research another resource type can be needed. Maybe it could be some ore or mineral that is valuable to aliens to fuel their technologies? Maybe this is one of the reasons the aliens use the shaman to make the tribals mine such ore. Some other resource can be Fruits & hunger level of villagers. Trees can have fruits, an infinite resource as long as there are trees near the settlements where villagers can wander to the nearest tree and pick fruit for a few seconds to feed their hunger. Hunger can affect their response speeds and combat abilities. I don't like this concept, it feels real dull. 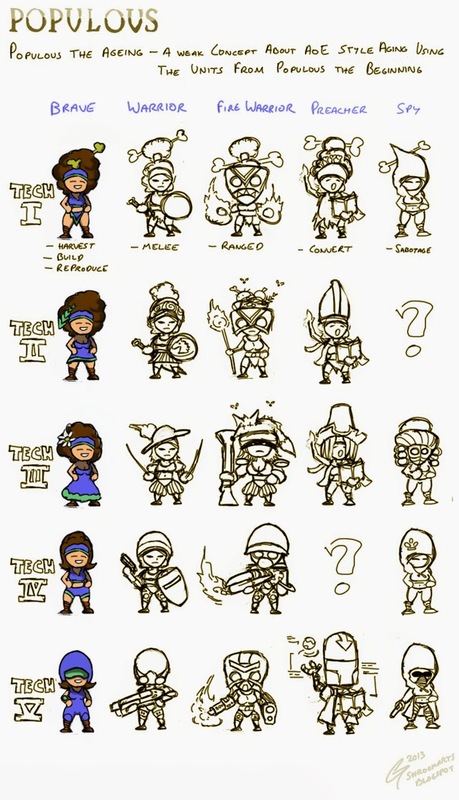 Seems like a direct rip off from age of empires style research system where your villagers change the way they dress as they level up. The sad part is the aliens are meant to be helping the tribals evolve but the way I made these dresses and items seem rather "human" until the very last age. So this turns out to be scrap. Maybe if the tribals kept their primitive looks but used alien tools that would make things more reasonable. Maybe a simple research tree with few alien upgrades per unit. Each research would make a visible change on the unit. Research can be done inside a new hut where braves would bring back green ore and worship the aliens until a flying saucer would see the green smoke, come to pick up the ore and trade technology.